As a company we hold no position on marriage law, and in line with our values support people’s freedom to choose who they love. We are not homophobic and are proud that our team members come from all walks of life and sexual orientations, and we respect everyone’s opinion and the right to freedom of choice – political, religious, marriage or otherwise. The paid advertising was undertaken on a commercial basis only, and it appears that there is now a perception that we endorse the views and values of the ACL. This is not the case. Gloria Jean’s Coffees does not support the independent views and values of the ACL. So it was just a good advertising deal, right? 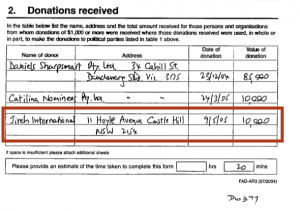 Definitely not a political donation to further the homophobic aims of the christian right, despite what the Australian Electoral Commission might think. What do they know about coffee, anyway? Well now here’s the weird thing. The other day, when Gloria Jeans were claiming ‘it is important to reiterate that we are not religiously affiliated‘, I remembered (as did Chrys Stevenson), that Gloria Jean’s holding company is called JIREH International Pty Ltd. If that doesn’t ring any bells, check out Genesis 22. Jehovah-jireh is the site where Abraham was all down for killing his son because the voice in his head told him to. 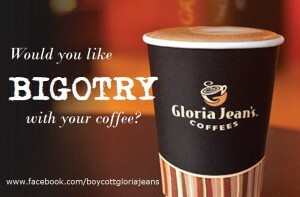 And Gloria Jean’s owners thought that was a fitting thing to commemorate by selling coffee. If that doesn’t strike you as mad-as-a-box-of-frogs religious, then their American subsidiary is much less subtle: Praise International. I chuckled at the obvious untruth, and filed it away in the back of my mind. And then today, it struck me as interesting that the ACL donation was listed by the AEC as coming from ‘Gloria Jean’s Coffees International’, not their parent company Jireh. I had a hunch, just as I had when I checked the Google cache for Hillsong Conference sponsors. 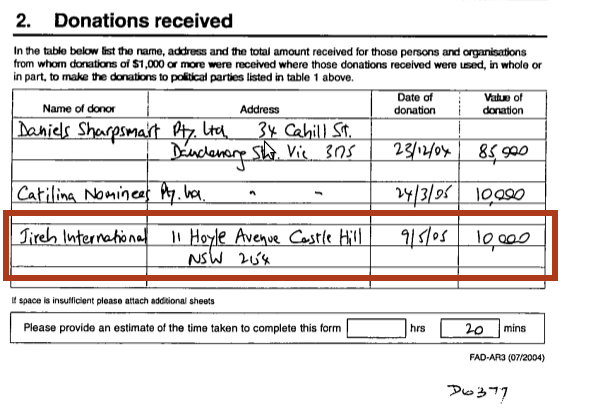 Had JIREH International Pty Ltd made any political donations, I wondered? So unless I’m mistaken, in 2005 Gloria Jean’s donated $10k to the Family First party, via GJ’s parent company and a thin wrapper around the political party. Which is a pretty big sum to give to an anti-SSM party while claiming to have no opinion on the issue, eh? This entry was written by Dave The Happy Singer, posted on June 15, 2012 at 22:58, filed under politics and tagged ACL, Australian Christian Lobby, Christianity, Gloria Jean's, Gloria Jean's Coffees, Hillsong, religion. Bookmark the permalink. Post a comment or leave a trackback: Trackback URL. Oh, yes! I remember that! Cheers! I wonder what taxes Gloria Jeans pays? Not the franchisees, but JIREH International Pty Ltd ? Since we’re on the issues of no religious affinity there’s Opportunity International Australia which appears at the bottom of every story on Gloria Jean’s “Who We Help” page, their catch phrase of whose work is motivated by “Jesus Christ’s call to love and serve the poor. Mercy Ministries which was supported by Hillsong; who’s pamphlets were distributed through Gloria Jean’s which was GJ’s co-owner Peter Irvine’s pet project(google that one). Then there’s Compassion Australia Hillsong and GJ gives big to this organisation who does not allow you to adopt if you don’t fit their Christian values of straight. They’re also a station sponsor for the main Christian radio station in Sydney, Hope 103.2. I was just looking for this info for some time. After six hours of continuous Googleing, at last I got it in your website. I wonder what is the lack of Google strategy that do not rank this kind of informative websites in top of the list. Generally the top web sites are full of garbage.